Before purchasing the GH4, I could find very little information applying to its use on filming wildlife. Now that I have owned the camera for several months I thought I would share my experiences for any other aspiring filmmakers. I should start by clarifying that I am a stills photographer. I have never done any film work apart from a few student films and speak very much from the view of an amateur. That said, I have always loved film and had a desire to shoot moving image, particularly of wildlife. I really can’t speak highly enough about this camera, quite simply it’s amazing. It’s greatest asset without a shadow of a doubt is the image quality. 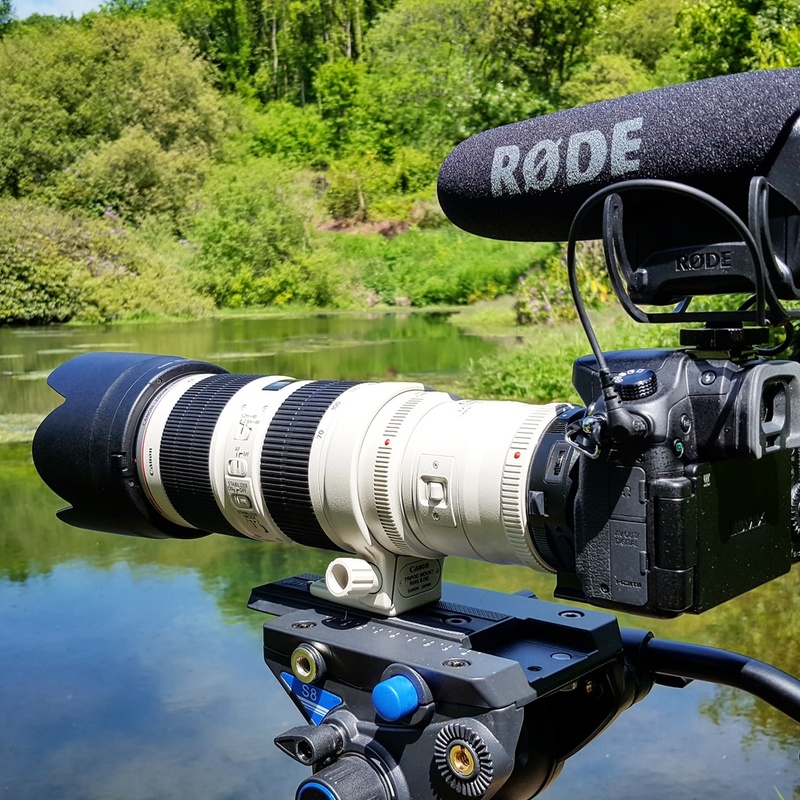 Not only does this camera feature 4K, which is very useful, but the standard HD footage from this camera is so much better than the canon 5D MKIII, that I was using previously. I agree with a lot of people that image sharpness isn’t the most important quality when talking about film, but for my own satisfaction, watching footage back from this camera is a joy. Moving beyond image quality, there are many other features that make this camera very special. There are so many little things I appreciate, its difficult to single any one out. Perhaps the most important for me are focus peaking, zebras, and the evf. These make filming so much easier when compared to my Canon cameras. In fact, it was always these features or the lack of, that pushed me away from filming with my DSLRs. Above: Showing the difference in both quality and framing between the panasonic GH4 and Canon 5D MKIII. Both shot from the same position using a Canon 500mm. 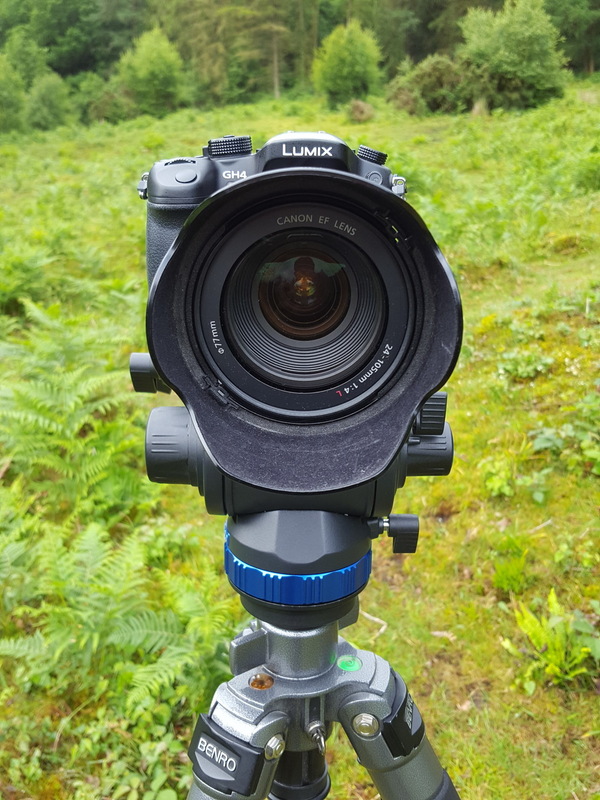 The most appealing feature I think for any wildlife filmmaker is the crop factor. Due to it’s small one inch sensor there is a 2X crop factor when compared with the full frame 5D MKIII. There is then a further crop associated with shooting in 4K. This means that my canon 500mm lens becomes an equivalent 1150mm. The icing on the cake is that in shooting 4K I can downscale it to 1080p and crop further into the frame. This is a massive difference. Shooting from the same position as my canon 5D I'm not only getting a longer equivelant lens but I'm also recording a sharper image. I will say however that getting quality footage still requires you to get up close to your subject. I mount my canon lenses to the GH4 with the use of a metabones ef to mft adaptor. I've tried this adaptor on all of my canon lenses and it works perfectly. The two issues commonly associated with using the adaptor are, a loss of light and an increase in depth of field. Honestly I’ve not found either of these to be a problem when shooting wildlife. No camera is perfect and there are some downsides to shooting with the GH4. The biggest difficulty I have found is the lack of a built in ND filter. Using larger lenses where I can’t add an ND filter means stopping down the lens which reduces image quality. This problem isn’t helped by the fact that the camera has a minimum ISO of 200. There is also the issue that if you are not shooting wildlife. For instance if it’s an establishing shot of the landscape, then the crop factor can become a problem. The widest lens I have available to me is the canon 24mm-105mm, which gives me a less ideal 48-210mm equivalent. Finally the issues I have had using the GH4 relate to the everyday challenges of filming. Avoiding camera shake with a 1150mm lens can be tricky. I should also say that I have been using the GH4 exclusively for video. Its not that the stills are bad but that they are unremarkable. I'll still continue to use my excellent 5D MKIII for stills. Overall, I am so excited to be using the GH4. I have shot a lot less stills recently because of it. The greatest praise I can give this camera, is that it is so much fun to use. I can’t remember a time when a new camera has offered me so much freedom and enjoyment to use. Did I mention that it shoots at 96 Frames per second!! !